This week's Law of Attraction question focuses on how to manifest a relationship with a specific person. Can you manifest a specific person? 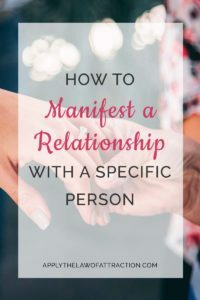 Manifesting a relationship with a specific person is a tricky area because many people focus on how they aren't in a relationship with the person, rather than focusing on the relationship they want to have. This can create a lot of resistance to manifesting a specific person, causing them to try to control the outcome. Whenever you try to manifest something specific, such as a relationship, sometimes you'll get it, but “it” may not include everything that you want. It's only afterwards that you realize that it wasn't what you really wanted. Because you are seeking to manifest a specific person, rather than the type of relationship you desire, the relationship you manifest with the person might not be the one you wanted after all – the specific person may not be everything that you truly want. Instead, you should focus on what you want the specific person to bring to your life, what you believe a relationship with this person would give you – love, comfort, fun, etc. He/she is always there when I need him/her. Remember that you can manifest whatever you desire, but it is the Universe that decides when and how you will manifest what you truly want. Keep this in mind if you ever begin to feel like the Law of Attraction isn't working, or you become scared or anxious. If this happens, remember to let the Universe determine how best to bring you the relationship you truly want. And if the specific person you want a relationship with is a match to everything you want, then you will manifest a relationship with that specific person. I am extremely impressed at how well this worked. I started using it 3 weeks ago. Last night the the guy I liked asked me on a date. You should write more. I’m so glad it worked for you Gina. I have a lot more that I plan to write. Thanks for the encouragement! I mean can I just sit home and send love or somehow I must be around him? I don’t get what to do! Plz plz help me with this.the only way I meet him is to go to his store,what does letting go of attachment to the specific one means exactly?to stay far from him? !not to be around him at all? Hi Mary, Thanks for all of your questions. Letting go of attachment doesn’t mean to stay far away from him. It means don’t worry about the outcome. You have to reach a point where you’re okay with whatever happens – being with him or not. When you’ve reached this state, you’ve released all resistance and are allowing the Universe to bring the relationship to you. Thank you very much dear Elizabeth. I really needed to hear from you,thanks for being there for us. Best of luck Helen! Keep visualizing and having faith. I hope things work out for the best for you. It’s so wonderful that you’re having so many successes! Thanks for sharing them! Keep walking with faith and the rest of your desires will happen. You already know how to make the Law of Attraction work. i am sorry i don’t get this. if the specific person has to like me back what is the use of using LOA then? i am honestly confused. please answer and thanks in advance. Like I explained, it all comes down to control, resistance, beliefs… If you aren’t open to allowing and have a low vibration, it’s hard to manifest anything you want, even a specific person. Focusing on something more general can move you away from resistance. It’s really about you – your resistance, your vibration, your control of the outcome. It is not about the other person liking you back. Elizabeth is no longer responding to posts. She’s working on answering everyone’s questions in future blogs as it says at the bottom of the comment box. There is a wealth of info on this site that should you help with your question. I might add that it’s never too late to attract that person back into your life. There’s people who have attracted a specific person into their lives that haven’t seen each other in a much longer time than a couple years. You have to imagine in great sensory detail, how wonderful it is to be in a loving relationship with that person. You must have complete faith in universe and not be disuaded by outer appearances until your desire is a concrete fact. You will come to realize if you haven’t by now, that it is completely possible to fulfill any one of your desires including a loving relationship with a specific person. Remember others have done this. Your no different! Much luck to you! 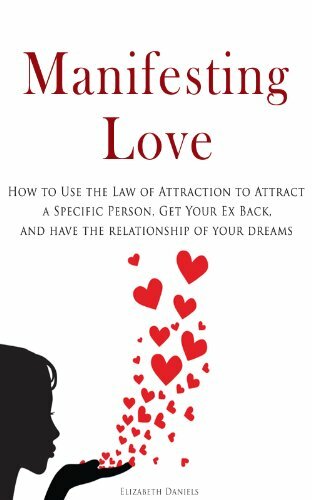 I’ve been trying to manifest my specific person for months and I have your book and I was wondering do you have to know your specific person to manifest them?